Once again, we thank you, and everyone who responded to our special call for help, as we began growing behind on our bills. We’re barely caught up now, though the bills continue. We’re faced with rising expenses beyond our control, and we give you our heartfelt thanks for your financial help and especially for your prayers on our behalf. It’s not easy keeping this 24-hour Catholic radio station beaming throughout 100,000 square miles, and we are sincerely grateful for your concern and your helping hand. WELCOME BACK! (left) It’s with joy that we announce the return of Betsy Brennan (here with 6-year-old hockey player son John), as part time office assistant. 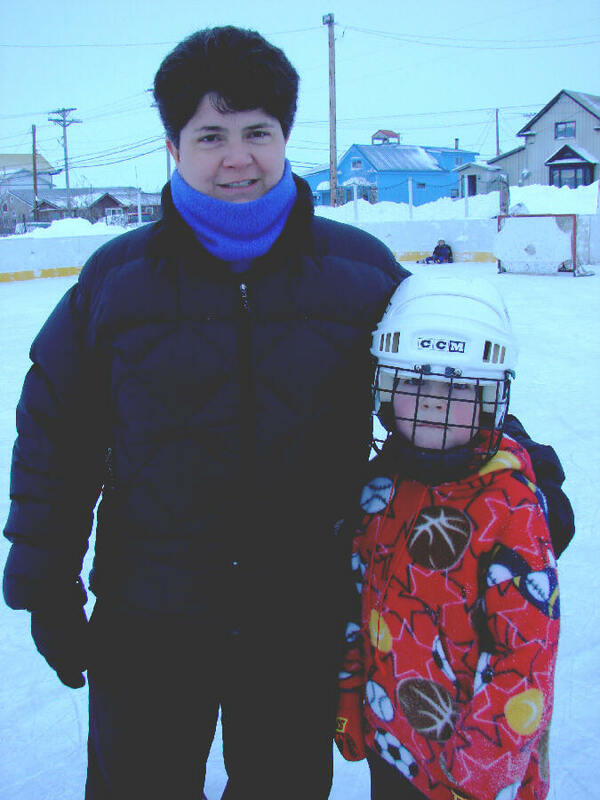 Betsy was raised in Hartford, Connecticut, and came to Nome in 1988 to serve two years as a KNOM volunteer. She remained in Nome and for thirteen years worked as a fishery biologist for the Alaska Department of Fish and Game. That’s where she met her husband Mike. Mike’s work frequently takes him out of town, and when Sarah (now 3) was born, Betsy left work to become a full-time mom. With her children a little older, she feels comfortable working a few hours a week. Betsy is a concerned and active individual. This past autumn, she was elected to a seat on Nome’s school board. Betsy, we are delighted to have you back with the mission. Welcome! and many, many others, thanks to you. Together, we are working to make a positive difference. INSPIRATIONAL SPOT: Almighty God, I ask what You want me to do, when You want me to do it, and how You want me to do it. 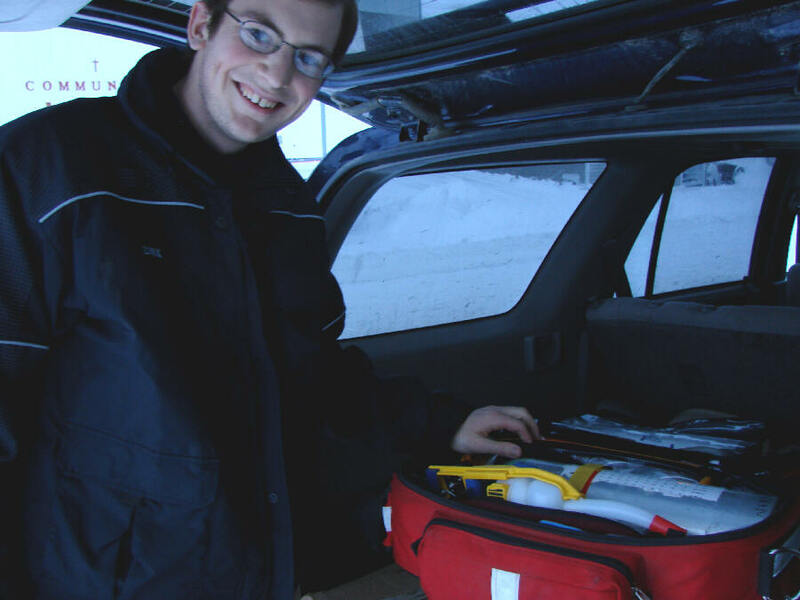 MAN OF THE YEAR: (left) Congratulations to KNOM volunteer news reporter Jesse Zink, who is Nome’s Emergency Medical Technician of the Year 2006! Last year, Jesse responded to 101 emergencies, everything from car crashes, alcohol and other poisonings and attempted suicides to drownings and heart attacks. When he’s not volunteering to save lives, Jesse works long days investigating, writing and reporting local and regional news. In his spare time, he’s learned to play ice hockey. We hope you are as proud of this young man as we are! BLIZZARD! In the second week of January, a brutal storm raked Nome with heavy snow and hurricane-force winds. The gale was so intense that the town virtually shut down, which is most unusual. Wind at our transmitter site, as it often does, exceeded 100 MPH. The site lost power for 67 hours, but KNOM stayed on the air, calming listeners and relaying emergency information, thanks to our backup generator. If you contributed toward this generator ten years ago, our listeners extend their deepest thanks to you. Please consider adding the KNOM mission to your will. We prayerfully place all bequests into funds that will provide for future major improvements, as well as protect the mission during future emergencies. INSPIRATIONAL SPOT: Come, Holy Spirit, enlighten my mind. Inflame my heart. Strengthen my will. Enlighten my heart with Your wisdom. Inflame my heart with Your love. Strengthen my will with Your grace. Give me light and strength and enthusiasm for Your work. INSPIRATIONAL SPOT: Jesus hands over a mission to His disciples. Even with all of their doubts and lack of faith, the disciples are entrusted to proclaim the gospel to every creature. Jesus’ church, in other words, is not a group of strong, confident, courageous believers. Instead, Jesus chooses weak, doubting and scared disciples to form His community of believers. His believers will go on to challenge and defeat those things which destroy human beings. 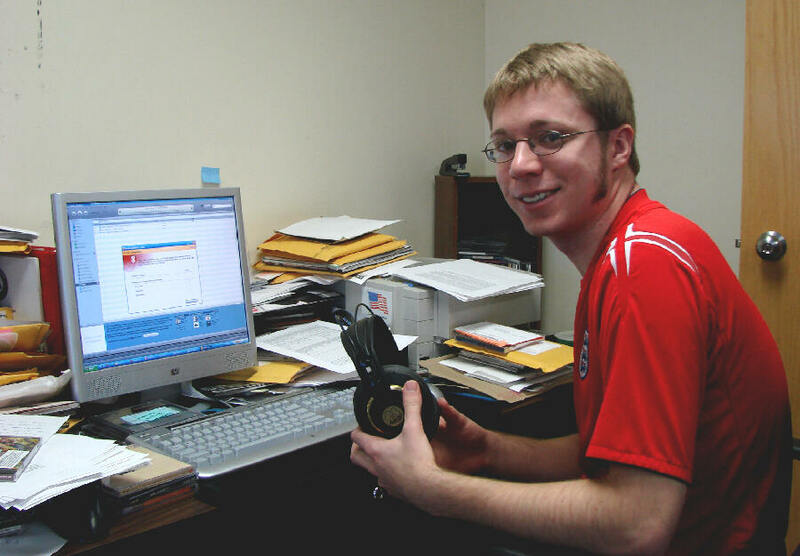 OF NOTE: (left) When he’s done announcing the morning program, you’ll find volunteer Ross Riley upstairs, reviewing and scheduling the station’s music. SAVING MONEY: It’s astonishing, good stewardship beyond what we had hoped. If you’ve been with us fifteen years, you helped us build a new volunteer house and a new studio building in 1992 and 1993. Both super-insulated, they replaced old, flimsy, run down, unrepairable structures, most of which were “temporary” pre-fab 1941 Army barracks. They were not only horribly expensive to maintain, but they were also dangerous: In the attic of one of them, we found all of the electric cables charred. At the time, we estimated that their replacements saved the mission $85,200 a year. Today, due to the skyrocketing cost of power and fuel oil, that savings is more than $115,000 a year! These solid-state devices dropped power consumption from 1,472 watts to 100 watts. Further, unlike regular bulbs, they do not need to be replaced every year by an expensive licensed tower crew. Due to the unexpected jump in electric power (29.5� per kilowatt-hour today), these lights have already paid for themselves, and are saving us an average of $4,100 a year. Thank you to everyone who made these improvements possible. God specializes in working through normal people who believe that He will do his work through them. He’s waiting patiently for an invitation to work through you. God expects us to attempt things large enough that failure is virtually guaranteed, unless God steps in. Your surrendered need turns into His unlimited opportunity. And then, God is glorified through you. INSPIRATIONAL SPOT: The saddest tears shed over a grave are the words left unsaid and the deeds left undone. CAVING IN: January’s first monster storm hammered Nome, but for Rosa and Tim Schmidt (left), it brought the opportunity for great fun behind the KNOM studio building. 400,800: That’s how many inspirational spots KNOM airs every year, along with an equal number of educational ones, plus vital news, the discussion of solutions to our region’s endemic problems, the Mass and Rosary, encouragement and companionship, thanks to you. QUITE A YARN: Thirty years ago this month, in February 1977, a KNOM volunteer leaves her dormitory on one of the month's colder days. She dons boots, parka, gloves and hat and walks to the rectory in the middle of a blinding snowstorm. She's spooked by the feeling that someone's tugging at her handbag. She turns and discovers that she's leaving a trail of yarn - its end was caught in her front door. OH, BABY! 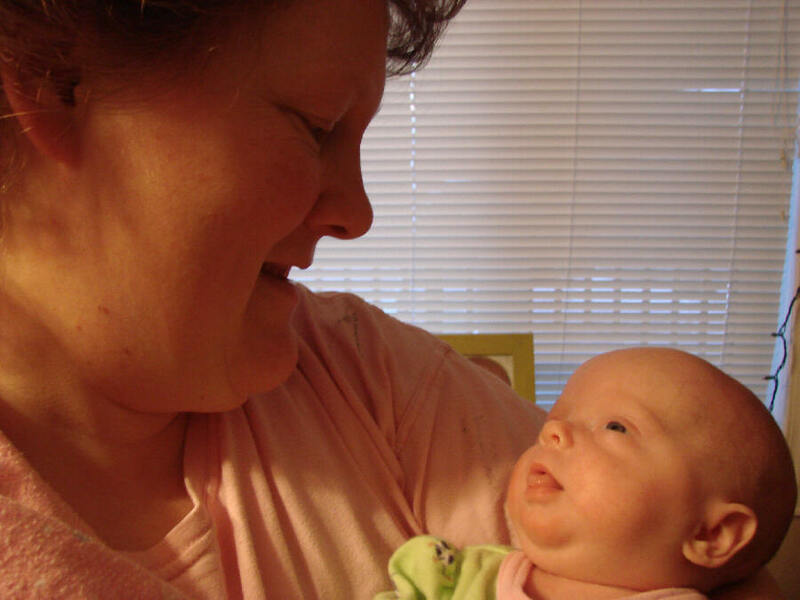 (left) Born severely premature, KNOM office assistant Robyn Woyte’s little Sophie was up to 5 pounds 10 ounces in mid-January. Sophie’s healthy, Dad John’s back from Iraq, and the family is thanking God for their blessings, and thanking you for your prayers. YOU ARE OUR STRENGTH. It is you who keeps the oldest Catholic radio station in the United States beaming strong. We honor you and we thank you. You and your intentions ever remain in our prayers. May Our Father reward you greatly!